The WISE project aims to develop a new communications solution based on the concept Flying Backhaul Mesh Network (FBMN). 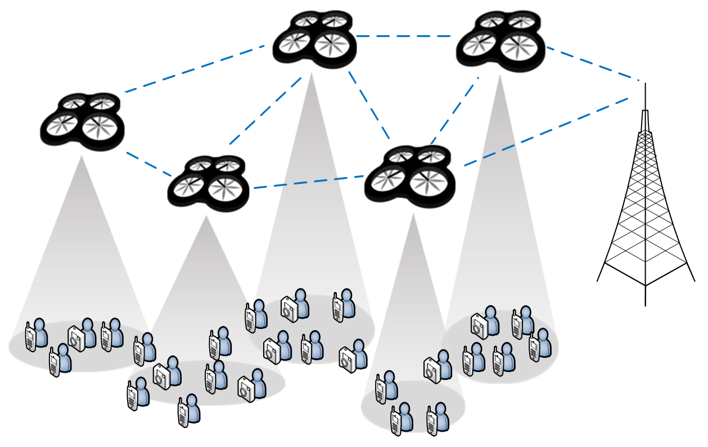 At the core of the FBMN concept is the usage of Unmanned Aerial Vehicles (UAV), more specifically Quadrotors, which will carry onboard Mesh Access Points (MAPs) and will form a mobile and physically reconfigurable wireless backhaul mesh network composed of Flying MAP (FMAP). This network will be self-organised and the FMAPs will position themselves according to the data traffic generated by the mobile terminals and the need to relay the traffic towards the Internet. The project is expected to produce not only relevant scientific results but also a solution that may have a significant economical value, thanks to the involvement of the TEKEVER company.